1873 Born in Hornsey the son of Robert Moffat Marples, an American Clock Importer. 1904 Selling imported Aries cars but in 1907 produced one under his own name. Used the name 'Windora'. 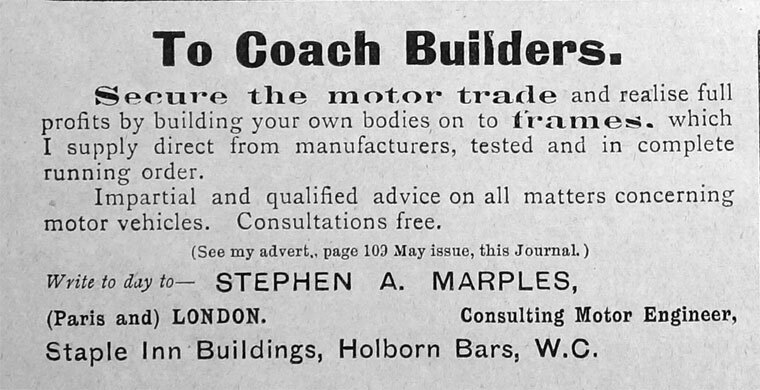 1911 Living at Warwick Lodge, Hadley Highstone, Hadley, Barnet, Herts: Stephen Arnold Marples (age 37 born Hornsey, London), Consulting Engineer. With his wife Constance May Marples (age 32 born Hornsey) and their two children Walter Keith Marples (age 3 born Hadley, Barnet) and Robert Arnold Greville Marples (age 1 born Hadley, Barnet). Married 6 years. One servant. This page was last edited on 8 March 2018, at 00:11.